For all wine lovers, there are certain regions and appellations whose bottlings speak to us with a greater sense of clarity, a more intense sense of pleasure, than others. Personally, I have a number of them around the world, and yesterday I had the chance to spend several hours with approximately 20 different wines from one of my favorites: Roussillon. Roussillon doesn’t yet have the fame that it absolutely deserves, but yesterday’s tasting and lunch with Export Manager Eric Aracil and the team from SOPEXA at New York’s Le Cirque, to kick-off the Roussillon Wine Council’s first American campaign--its full name is the Conseil Interprofessionnel des Vins de Roussillon, or CIVR for short--demonstrated how important it is for more consumers to familiarize themselves with Roussillon and its utterly delicious wines. In a couple of weeks, I’ll be dedicating an entire post to my tasting notes from yesterday, but for now it will have to suffice to say that my overall impression of the wines was 100% positive. They are among the most expressive and food-friendly I’ve tasted lately, and the combination of a fabulously diverse range of terroirs, geology, and geography, as well as dedicated, passionate producers, means that each and every wine we tasted yesterday was intimately tied to a very specific piece of the earth. From wildly refreshing rosé to crisp, white-fruit-and-licorice-scented whites to reds whose flavor profiles ran the gamut from briny all the way to densely fruited and reminiscent of Austrian sachertorte, and then on to sweet wines like Maury and Rivesaltes Ambré, both the range and quality of the wines was remarkable. 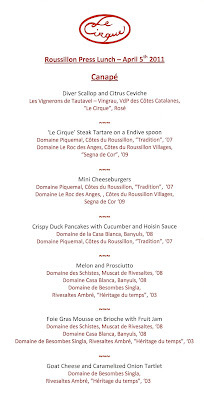 And having the chance to taste them alongside the excellent food prepared by Le Cirque served to deepen my understanding of not just how wonderful the wines of Roussillon are on their own, but also how brilliantly they work at the table. 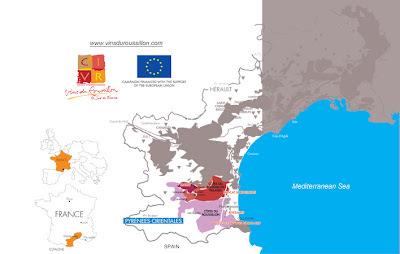 The wines of Roussillon, then, may not share the fame of some other parts France yet, but the quality and expressivity is there in abundance, and I have no doubt their recognition and market share will continue to grow. I cannot recommend them highly enough. Roussillon is on the rise, as this spectacular tasting and lunch showed.